People have been forecasting the death of the PC for years, and while all that noise is clearly overblown, there is one segment of the computing world that should probably go away: the traditional clamshell laptop. Now I’m not saying we should do away with notebooks PCs as we know them or more specialized notebooks like mobile workstations or gaming laptops, I just think it’s past time we replaced all the boring old notebooks with 2-in-1s. There’s not a single thing a normal clamshell can do that a 2-in-1 can’t, and it’s been 15 years since the first convertible came out, so it’s not like you have to shell out a big premium for that added flexibility either. 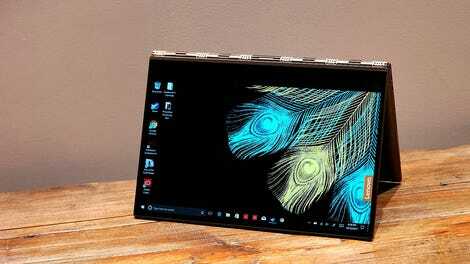 And for years, Lenovo’s line of Yoga 2-in-1s have been among the best thanks to flexible hybrids with solid (and pretty sleek) builds and top-notch specs that were held together by the best hinge in the business. On the new Yoga 920, that package is getting even better thanks to the addition of full Windows Pen and Ink support and new far-field microphones that in a number of ways have turned the Lenovo’s new high-end Yoga into the computer the Surface Laptop wishes it could be. Starting at $1,300, the Yoga 920 costs $300 less than a comparable Surface Laptop despite having the same 8GB of RAM and 256GB SSD. And for all that extra money, the Surface Laptop’s biggest advantage is really just its 13.5-inch screen which has a slightly higher 2256 x 1504 resolution when compared to the Yoga 920’s slightly larger 13.9-inch touchscreen at 1920 x 1080. Meanwhile, the Yoga 920 has a screen that bends back all the way, transforming it into a presentation device or a big ‘ole tablet depending on your needs, more ports thanks to a healthy mix of two USB-C ports with support for Thunderbolt 3 and a USB 3.0 Type-A port, and even a built-in fingerprint reader with support for Windows Hello as part of its standard kit. But more importantly, the Yoga 920 also comes equipped with one of Intel’s latest 8th-gen CPUs, which offers a pretty meaningful improvement in performance over systems still saddled with last year’s processors. A quick flip and the Yoga 920 turns into a great web browsing device. On our photo editing test, the Yoga 920’s Core i7-8550U CPU resized 22 20-megapixel photos in just 50 seconds, which is 25 percent faster than laptops with 7th-gen Core i7 CPUs including Dell’s XPS 13 (69.6 seconds), HP’s Spectre x360 (67.9 seconds) and the LG Gram 14 (69.1 seconds). Results from Geekbench 4 back up our real-world tests too, as the Yoga 920 posted noticeably higher CPU benchmarks for both single and multi-core performance, especially on the latter which scored almost twice as high thanks to the 8th-gen chip’s higher core count (four cores for 8th-gen, two cores for 7th-gen). I would have liked to see Lenovo also offer a model with an 8th-gen Core i5 CPU, in hopes of knocking down the system’s starting price to something closer to $1,000, however it seems that’s not the cards. What’s even more important though, is that all this speed doesn’t really affect the Yoga 920's endurance. Sure, if you feel like editing videos all day, you can still kill this system pretty fast. But on our battery rundown test, the Yoga 920 lasted 9 hours and 42 minutes, which is about the same as its competitors which posted an average battery life of 9:51. Then there are other nice little touches such as Lenovo’s decision to include a USB-C charging brick, which means the same cord used to charge the Yoga 920 can also be used to refill other devices like a smartphone or a Nintendo Switch. That means you’ll have less cables to carry around. There are also new far-field mics so Cortana can understand you better even when you’re standing on the other side of the room, and while there’s not much to say about the Yoga 920's touchpad and keyboard besides that they work, having multiple levels of backlighting can be helpful at times. Really, my biggest gripes with the Yoga 920 are that it doesn’t come with an on board microSD or SD card reader, which is the one thing that might stop me from bringing it around to meetings or conventions where I’m constantly transferring photos from my camera to my laptop. It also seems a little strange that Lenovo included a fingerprint sensor that works with Windows Hello, but didn’t give its 720p webcam the same treatment. On top of that, the Yoga 920's webcam is in the wrong damn place (below the screen), which means anyone on the other side of video call is going to get a great look at the bottom of your chin. 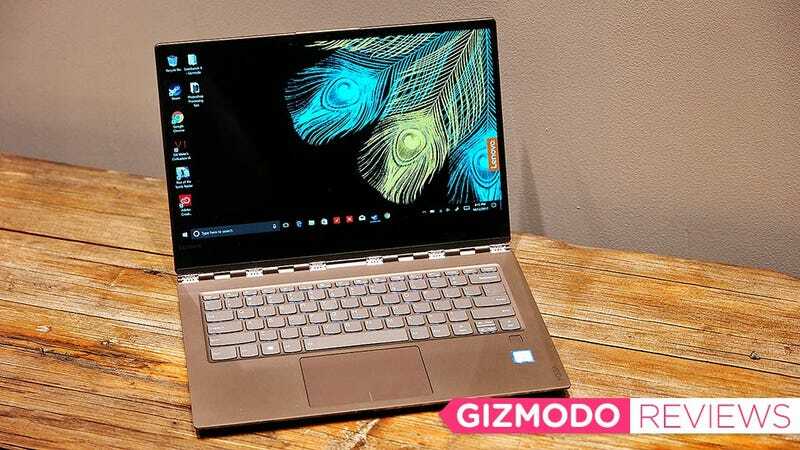 I’m also a little annoyed Lenovo got rid of its signature orange color option, because our chocolatey bronze review unit feels like Lenovo is playing it safe. People who want boring can always opt for the silver one. Lenovo even takes care to color match some of the metal on the watchband hinge, which is nice. But even at $1,300, the Yoga 920 is close to being my ideal portable PC. Now I will admit, when decked out with similar specs including an 8th-gen CPU, Dell’s XPS 13 does have an SD card slot and costs just $1,150. But for that price, you don’t get a touchscreen, which once again, gives the edge back the Yoga 920. Look, I’m not trying say that you need to toss your current system in the trash right this second, but if your only objection to 2-in-1s is that you don’t think you need that kind of flexibility, give one a chance, because you might realize what you’ve been sleeping on. Change is a good thing, and thanks to hybrids like the Yoga 920, there aren’t really any good reasons to hate on 2-in-1s anymore. Lenovo’s 2-in-1 watchband hinge is still the best business. New 8th-gen Intel CPU offers noticeably better performance than previous chips without really degrading battery life. The fingerprint reader support Windows Hello, but the webcam doesn’t and it’s in the wrong spot.